On this page, MTGO Academy has organized its gradually expanding set of resources for limited play on Magic Online. All of the below are downloadable for free and may be incorporated into your Magic Online experience to improve your draft and sealed play. The below download links connect to images to be incorporated into the “gamemats” file of your V3 Magic Online software. They are custom playmats that will keep you posted on what tricks and spells your opponent could play with his or her available mana. To learn how to use a custom playmat on Magic Online, watch this short video by PlanetWalls. Click here to download a playmat featuring the flash spells and instants from Magic 2014. Click here to download a playmat featuring the flash spells and instants from the triple Theros draft format. Custom playmats are not currently supported by the V4 Beta client, only by V3. Because many players vary the settings of their Magic Online user interface, and also have different system and monitor specs, it is difficult to predict how the playmat will look at any given setting. (Magic Online also automatically crops and stretches images when you shift your UI settings in client.) This means that the playmat may not look optimal depending on how you have your windows stretched, minimized, enlarged, etc. As the game progresses, cards will begin to cover parts of the playmat. There is nothing we can do to circumvent this, but you are always free to click and drag the cards to see what part of the playmat is underneath. Your opponents will NOT be able to see your custom playmat. Remember that, in order to use a custom playmat, you must replace one of the current playmat files Magic Online uses. We recommend that you first duplicate the official playmat image and store it elsewhere on your system so that you don’t lose it and have to reinstall Magic Online if you want to use it again later. 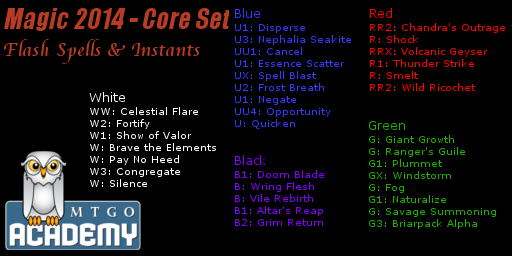 If using a custom playmat with card names isn’t your style but you would still like to refer to a list of flash and instant spells without searching through Gatherer, you can load up one of these .txt files as a decklist in Magic Online. Each is organized by color and casting cost of the flash spells and instants in the limited format. 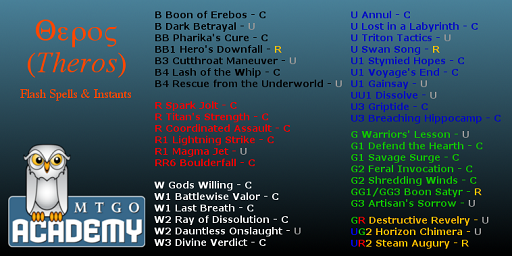 Click here to download a list of the flash spells and instants from triple Theros draft.